WR Robby Anderson vs. CB Ken Crawley – Both Anderson and Crawley have had solid seasons, as Anderson’s overall grade of 81.0 ranks tied for 20th out of 116 qualified receivers, and Crawley’s overall grade of 80.7 ranks tied for 33rd out of 118 qualified cornerbacks. Crawley did struggle last week against Atlanta, as he was targeted five times and allowed four receptions for 73 yards and a passer rating of 118.8. T Brandon Shell vs. Edge Cameron Jordan – Jordan has had a phenomenal 2017 campaign, as his overall grade of 94.4 is tied with Von Miller for the best in the league among edge defenders. Handling him will be a tall task for Shell, whose pass-blocking efficiency rating of 94.9 is tied for 34th out of 80 qualified offensive tackles. He is responsible for six sacks, which is tied for the eighth most among tackles. Containing Jordan is no easy task, so look for the Jets to send extra resources in his direction. 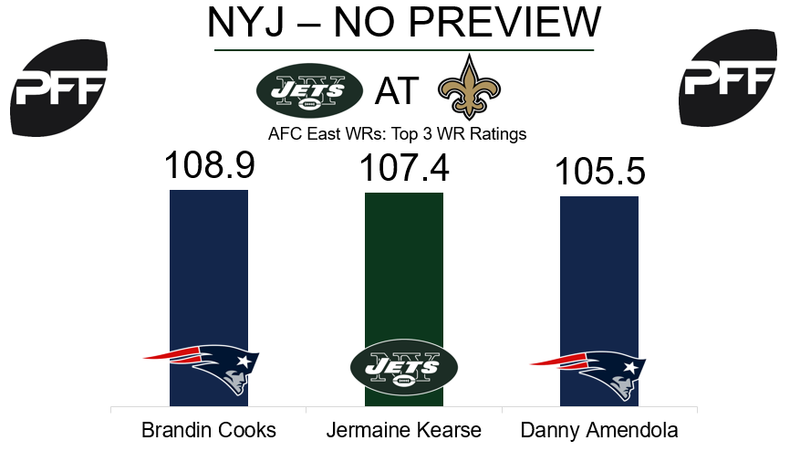 WR Jermaine Kearse vs. S Kenny Vaccaro – Kearse is at his best running routes from the slot. He averages 2.08 yards per route run in the slot, which is sixth-best among 63 qualified receivers. He also has the 14th-most receiving yards in the slot at 400 and only two drops on 38 targets. The Saints will likely match up Vaccaro on him for most of the contest, which despite Vaccaro’s poor overall grade of 36.7 (last among 88 qualified safeties) could be a very tight battle. Vaccaro ranks 14th out of 53 qualified players in passer rating allowed in the slot at 83.2. RB Mark Ingram vs. LB Darron Lee – When looking purely at run snaps, Ingram has slightly out-snapped Alvin Kamara over the past four weeks, which should continue down the stretch. Ingram has 12 runs of 15-plus yards for a breakaway percentage of 37.8 that’s fifth among 24 running backs with at least 142 attempts. He’s also been excellent as a receiver, as his 1.47 yards per route run is tied for 21st among qualifying running backs. Lee presents an exploitable matchup at linebacker. Lee’s gotten a run stop on 8.3 percent of his snaps, a figure that ties him for 26th among 53 qualifying inside linebackers, and he’s been an average-level tackler. His 12.8 tackle efficiency rating against the run is 40th among 76 eligible inside linebackers. 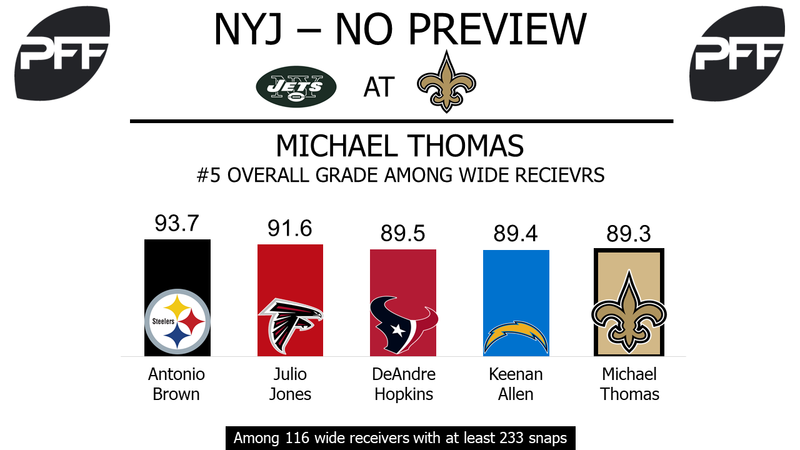 WR Michael Thomas vs. CB Darryl Roberts – Michael Thomas’ continued stellar play has earned him an 89.3 overall grade, now fifth among 116 qualifying wide receivers. He still hasn’t dropped a pass since Week 4, and his 2.3 drop rate is now third among 32 wide receivers with at least 76 targets this season. Thomas has spent the majority of his snaps as the left wide receiver, so he will line up against cornerback Darryl Roberts, who’s spent the majority of his coverage snaps as the right cornerback over the past few games. Roberts has allowed the 10th-most yards per snap in coverage, and he’s been targeted regularly, as his 5.6 cover snaps per target ties him for the 12th-most frequently targeted qualifying cornerback. QB Drew Brees vs. LB Demario Davis – Drew Brees’ last few game performances against some quality pass defenses have lowered his overall grade a bit, but his 85.7 overall grade still stands at sixth among quarterbacks. His 80.2 adjusted completion percentage ranks him No. 1 among qualifying quarterbacks, and his 79.1 completion percentage on throws made in 2.5 seconds or less is the second-highest. On a number of those quick throws to Kamara and Ingram, he’ll be challenged by linebacker Davis. The Jets linebacker has allowed a paltry 0.71 yards per snap in coverage, the third-best mark among 49 inside linebackers with at least 242 snaps in coverage. He’s also played 10.6 snaps for every reception he’s allowed, 16th most among the same qualified inside linebackers.